I made a little pouch to send in the mail as a thank you and I liked it so much I continued making a few more. 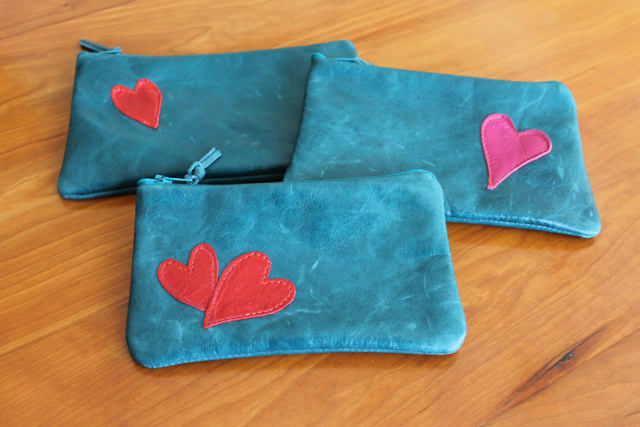 These are made of great leather in either red or teal with corresponding hearts sewn on the front. Inside they are lined in 100% cotton. 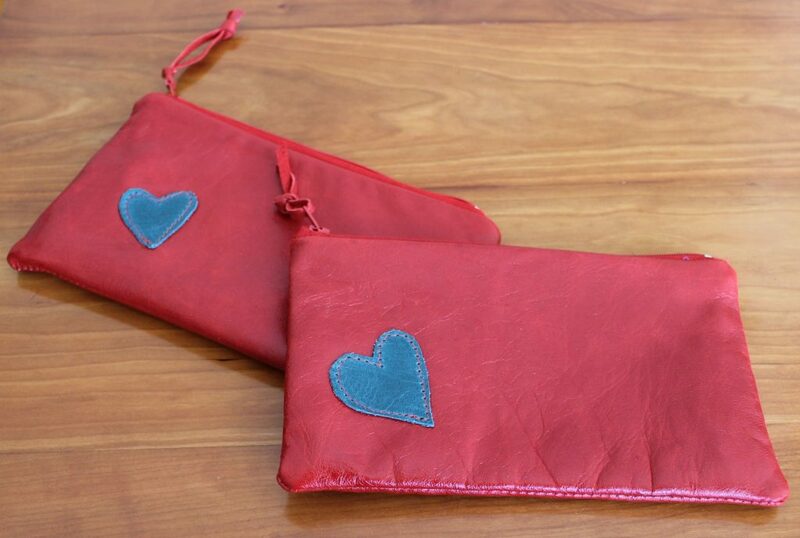 These make a great little case for your phone, cards or other essentials. In the online store today. I was away last week in an idyllic place. It was a perfect spot to hide away from world events. 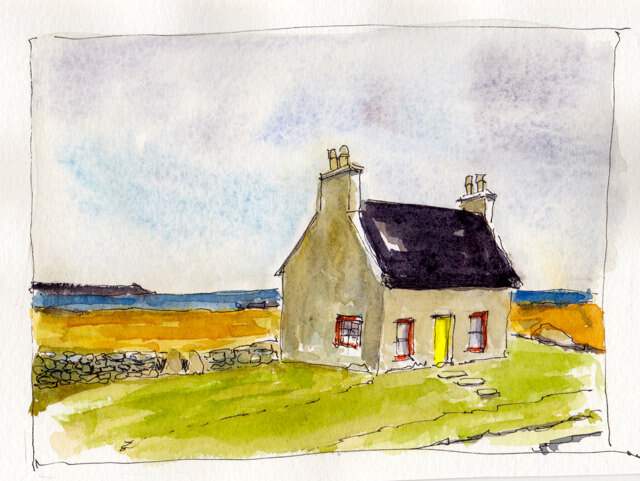 While there I worked on the small hooking below of another favourite retreat, our small island cottage. These small hookings I have been doing lately are like sketches done in preparation for a larger piece, investigations of colour, texture, composition and materials. 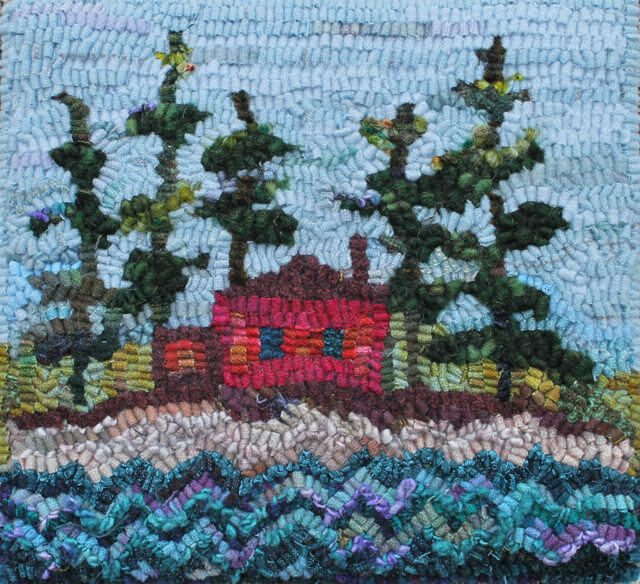 This cottage piece has loopy shiny yarn and small pieces of painted velvet which I cut into strips. Translucence. I am back home now in the grey, soggy, climate-changed January of my city. 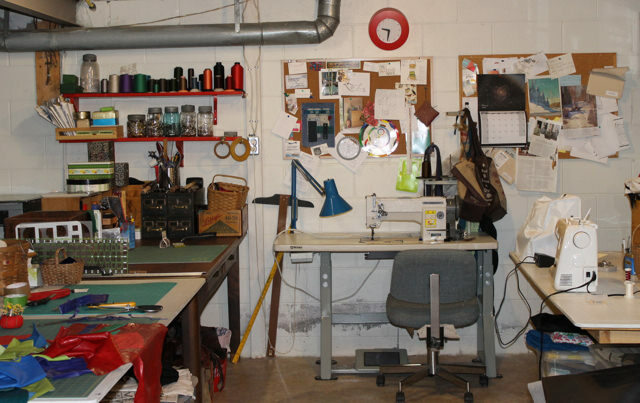 And I am retreating again, this time to my basement studio with my sewing machines and bins of leather. I know I can’t hide from what is happening, that attention is required, but I also know that my sanity comes from these quiet places of creativity. And maybe some new creations. 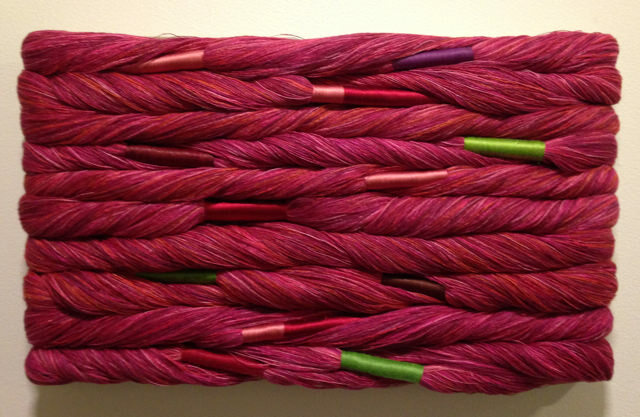 I visited the Textile Museum last week to see the Sheila Hicks exhibit, Material Voices. 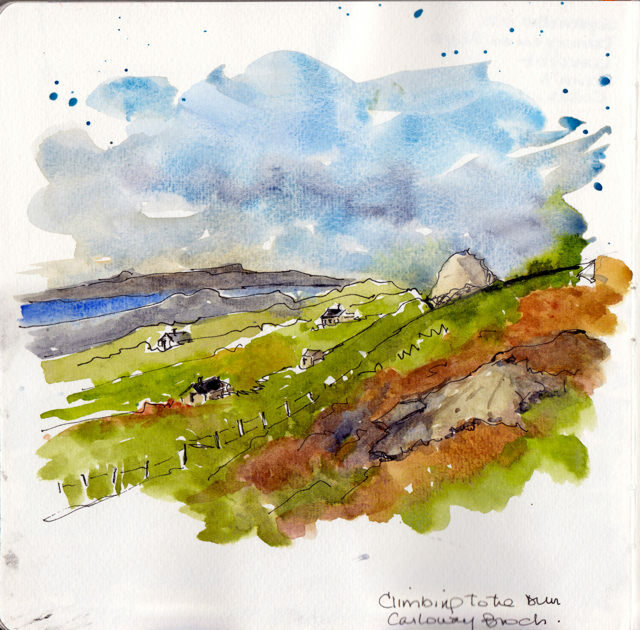 This link will take you to Hicks’ site with photos of the full range of her work. The large wrapped and coiled structures are exuberant, brightly coloured and impressive. The show in Toronto contains some of these and also excellent videos of the installation of her enormous architectural pieces. Bas-relief panel for an architectural project. I loved the thought of carrying a small frame and weaving on the spot. Testing out ideas in small hooked pieces is something I’ve been doing in the last few months–although in the studio, not on location! I have two big projects in mind and I’m taking my time working things out in my small mats. 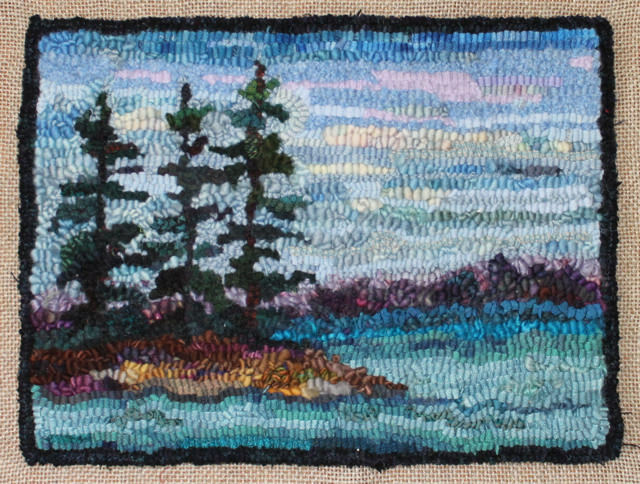 By the way, I’ve updated both the Rug Hooking Gallery and the Leather Gallery to include all my work for the last year. It’s good record of what I’ve tried and helps me see where I want to go next. 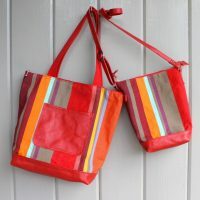 Check these out by clicking the link under Navigation on the right hand side of the blog page. 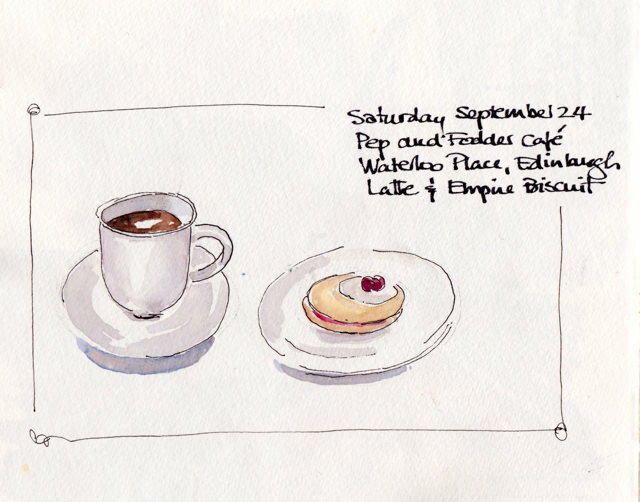 Sunday mornings are the best for sketching. 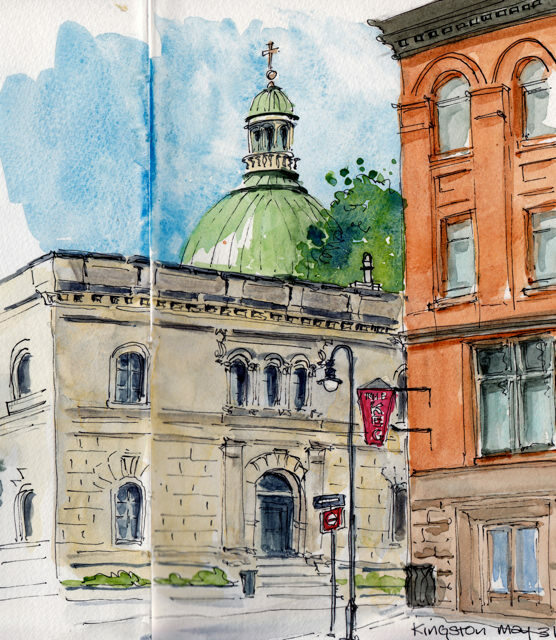 The city is quiet and I can park easily and sketch views otherwise unavailable. 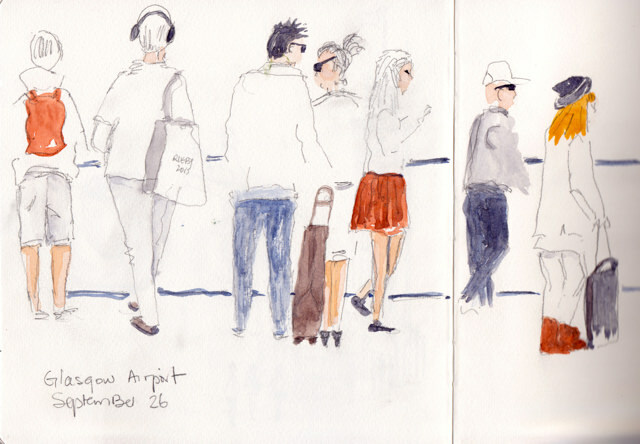 But this past Sunday was frigid and my feet were nearly frozen after I completed this sketch. 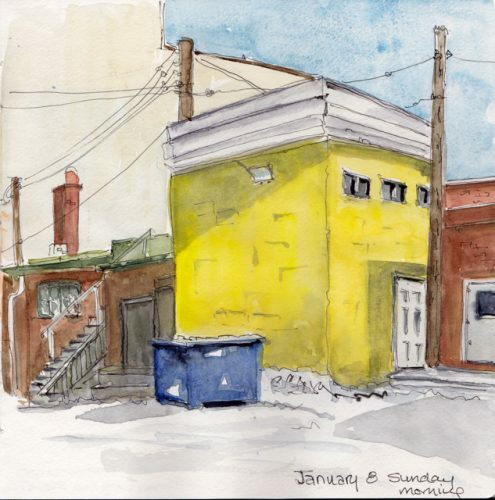 I think the cold distorted my vision too–I’ve made the yellow building much taller than it really is. This sketch was completed at home the next day. 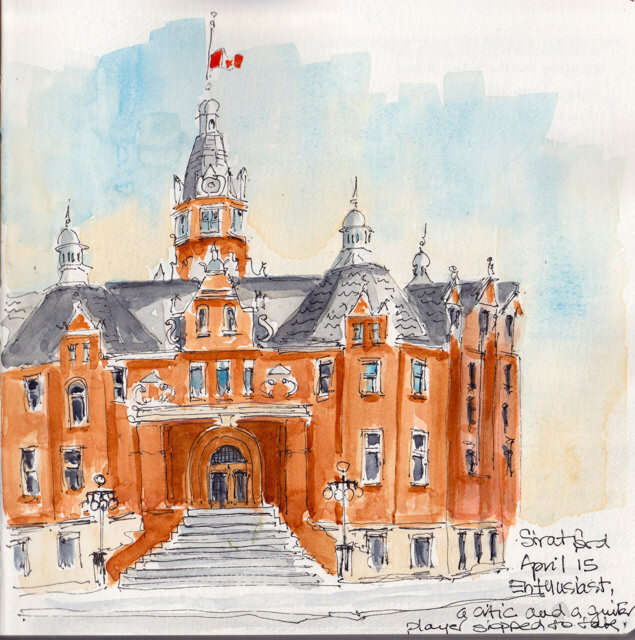 Over the course of this year I am going to try to sketch as many of the historic buildings in the city as I can. Even though this one is on a city street, it has the feeling of a country setting. This was done without my usual ink outline, so seems softer. 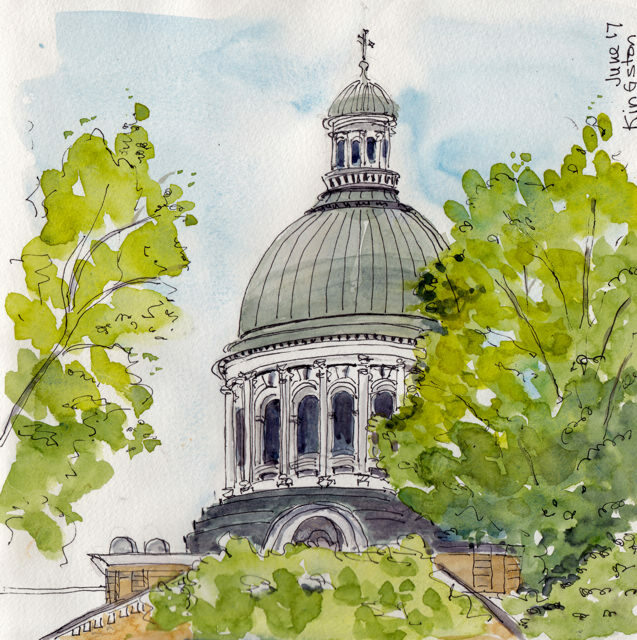 Lots to experiment with and work on this year–hope to do a sketch a day around the city, improving technique and composition. Goals. That’s what the new year is about, right? The new tote is named for my upcoming travel destination. But more on that later. I have been thinking about a new larger travel tote for some time. 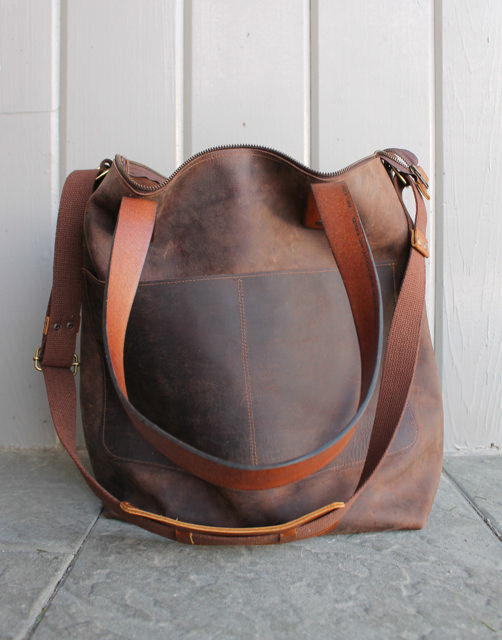 In the fall I made a bag from this leather and really liked it. 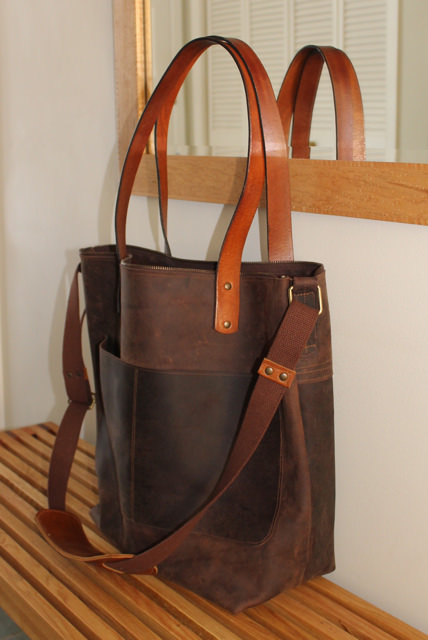 There was just enough leather left for a new larger bag. 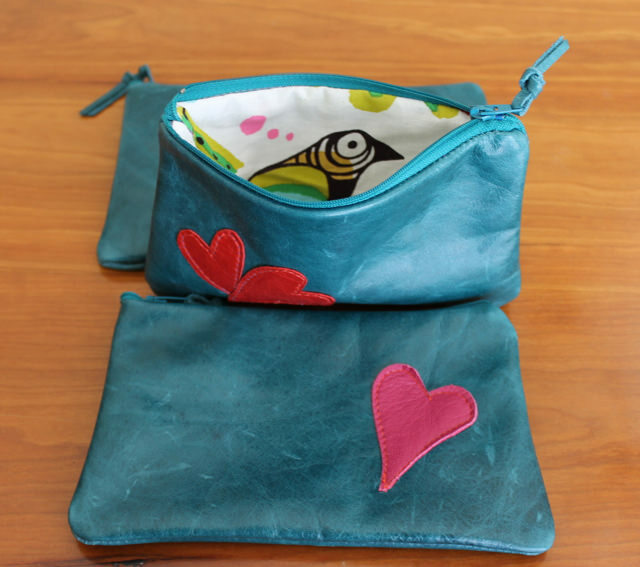 It is a simple design, unlined, with two large pockets on the outside and another inside. The handles are repurposed from a wide leather belt–I slit the leather in two and finished the edges. The long strap is cotton webbing with a leather shoulder protector. 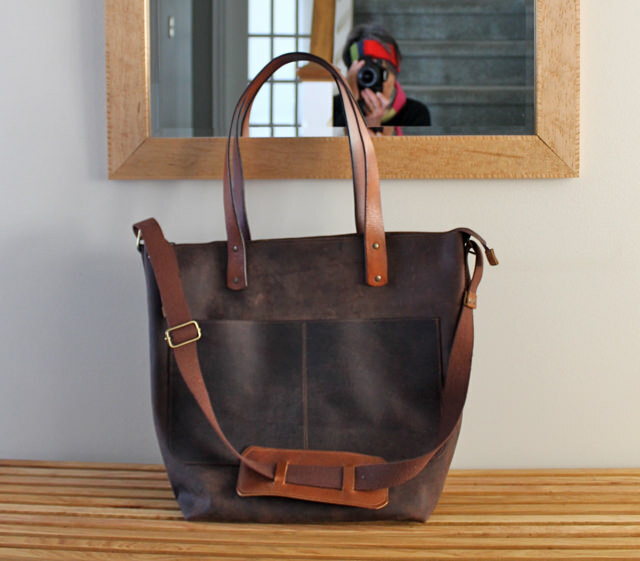 I like the contrast of the dark chocolate leather with the carmel handles and strap. (Delicious!) 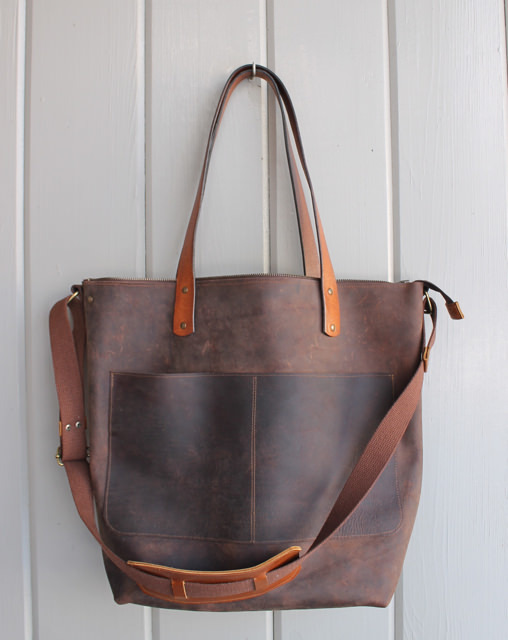 This bag is large, 19″x15″x6.5″ and with a double leather bottom made for heavy-duty use! I think the third photo especially gives an idea of the character of this leather. I am hoping it will just get nicer as it ages. I’ll report back after its first trip. 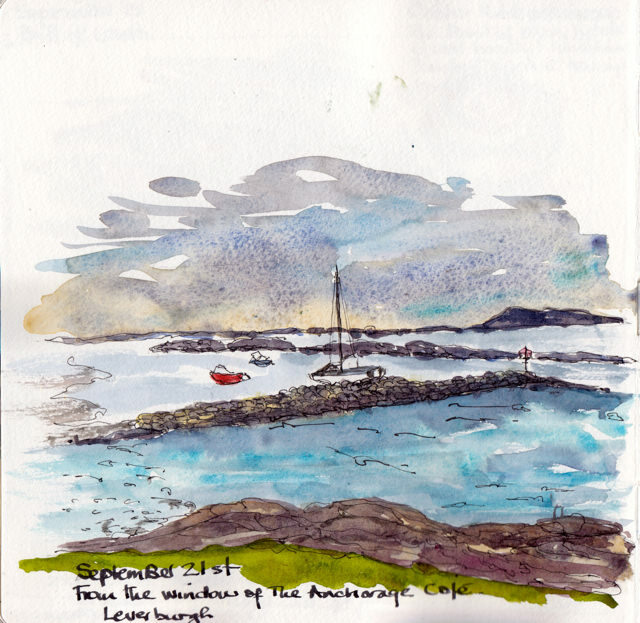 I have not posted many of the Scotland sketches before so here are some of the most memorable. 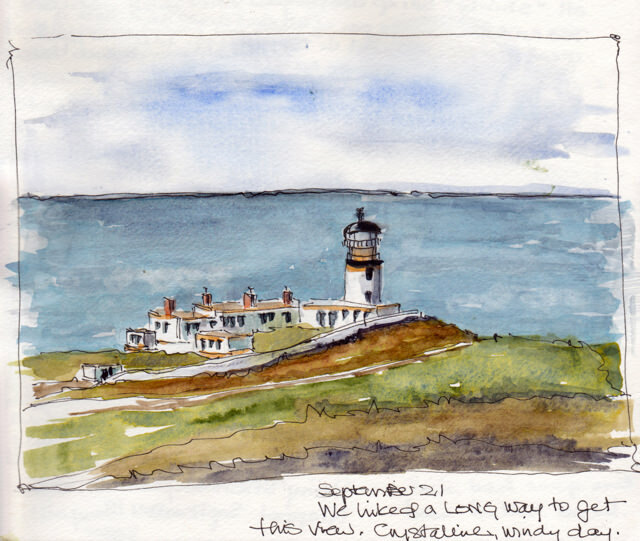 Going through the sketchbook brings each day of the trip back. 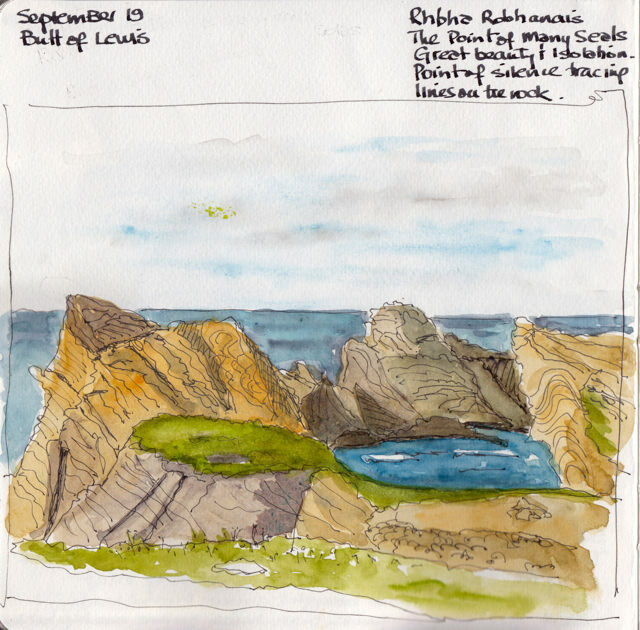 There is nothing quite like sketching on the outer edge of the continent or in the very location of a bloody battle you have heard about all your life. All but one of these sketches were done on sight, (as you can tell from the mucky marks on the paper) and sometimes paint was added later. 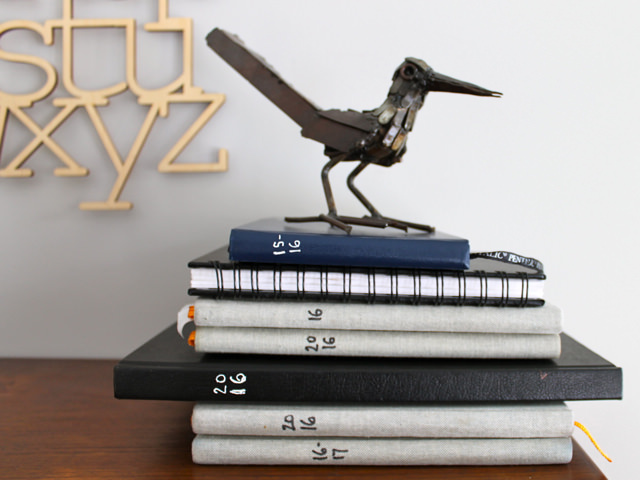 I had no plan to photograph my pile of sketchbooks, but when I lined them up I was astounded at just how many there were. My plan was to choose a few of my favourite sketches and post them as a review of the year as I did last year. But I just couldn’t resist stacking them and taking a photo. When I started sketching last January I had two goals: improve the composition of my sketches and work on the depth of colour. I’ve chosen my favourite sketch from each month and I think overall they reflect an attempt to work on both goals. 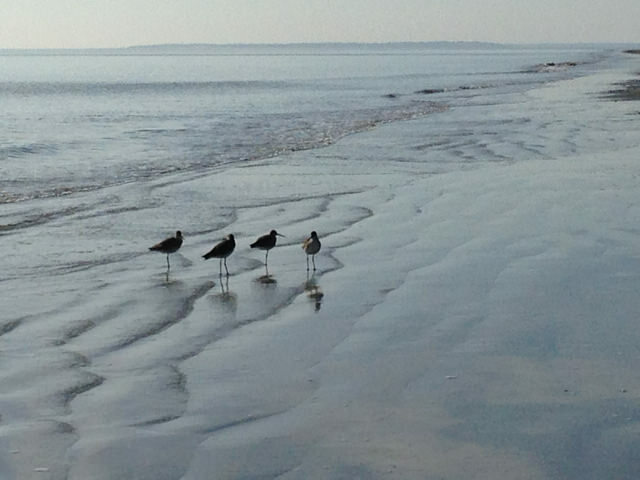 And just as important, they evoke the feeling of time and place for me, the weather, the company, the mood. 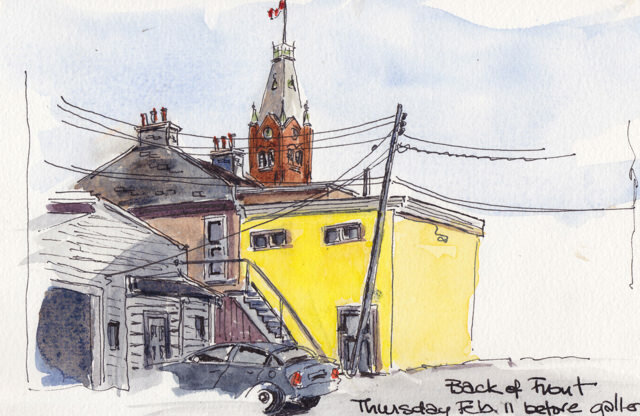 This first sketch is was done in Picton Ontario, sitting in a parked car with my great friend A, she in the front seat, and I behind her. It actually was done in late December, but I’m including it because it is in the first sketchbook. This is January’s sketch. 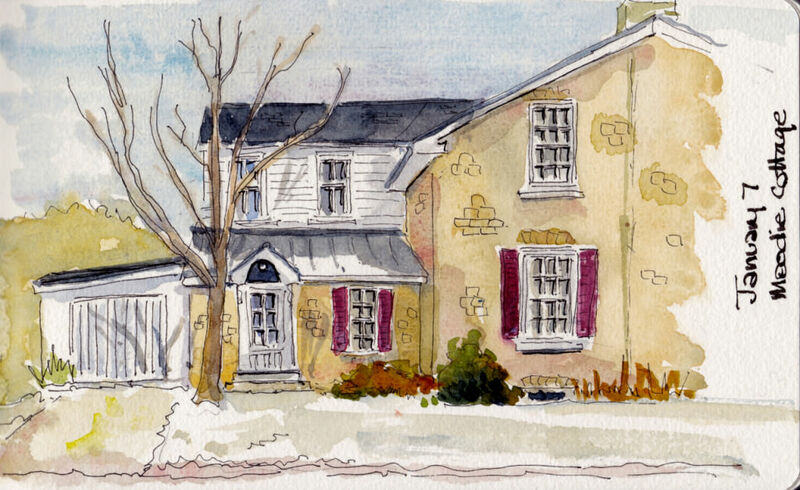 I parked on the side street facing the Moodie cottage in Belleville. 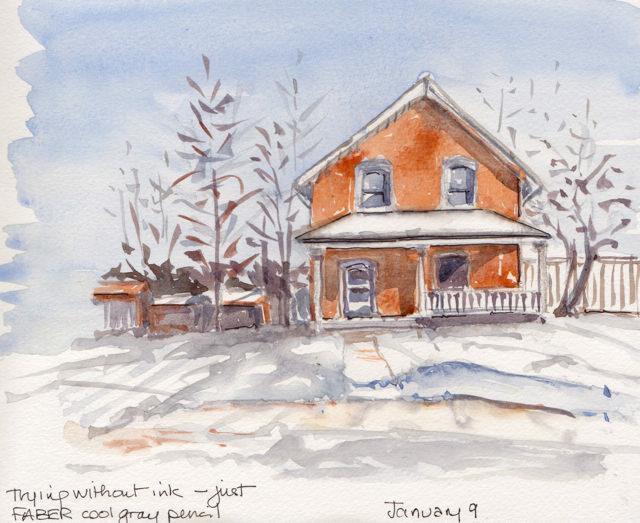 This sketch is particularly meaningful to me because I once lived in that apartment behind the main house. 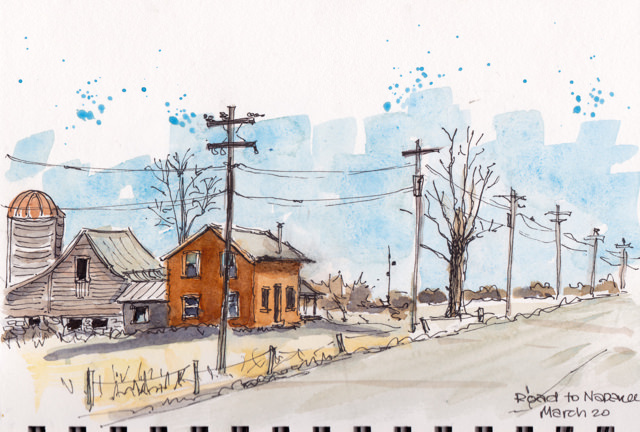 February’s sketch is also in Belleville. Again I was in the car, parked behind the main street. My favourite building, the City Hall, is peeking over the old stone chimneys of Belleville’s early storefronts. This is on the road to Napanee, the town next to ours. 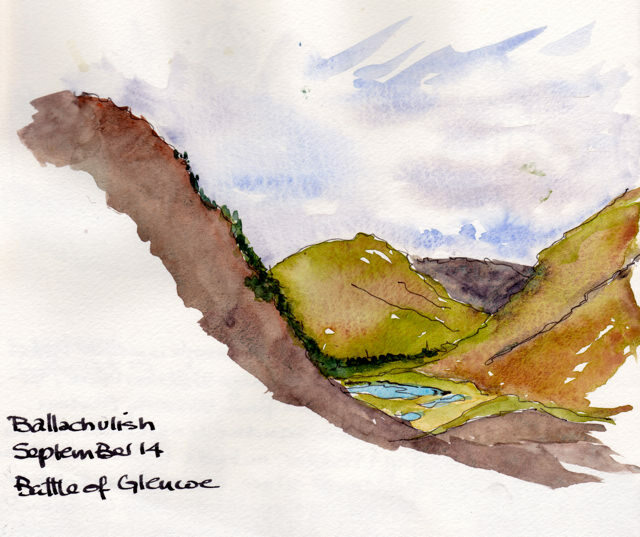 Again, sketched from the car. 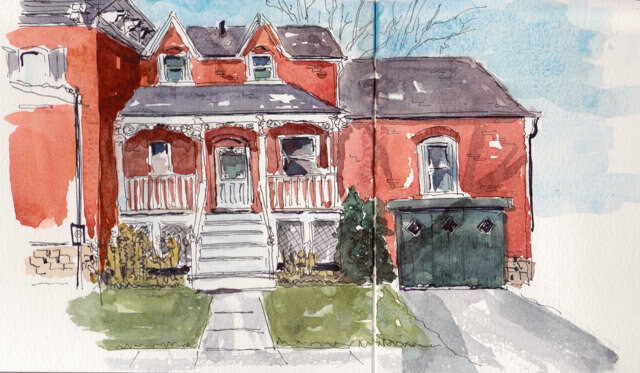 This one was sketched in April, but it was warm enough for me to be sitting on a bench in Stratford Ontario. Recorded are the people who came by to comment. This is my favourite sketch of the year. I was sitting on a bench behind the City Hall in Kingston to capture this view. Again Kingston and the same Church tower, from a different spot. I’ll continue tomorrow with the next 6 months, including our trip to Scotland. To all those who visit this blog, I wish you and your close-ones the very best for 2017. The world seems an uncertain place these days–and I’m hoping along with Liz Lochhead that “the light comes back”. We can work together to make it happen for climate, for civic harmony and for peace. Let’s each do our bit, whether big scale or small.